A triple threat of top notch reggae coming at ya! It is with great pleasure we welcome back, Keron “Kabaka Pyramid” Salmon touring with new music from his debut album, Contraband. We’ve been anxiously awaiting this release executive produced by Damian Marley. If you haven’t seen Kabaka before, he’s one of our favorite up-and-coming talents out of Kingston. He’s got a captivating musical style blending the power, energy and melody of reggae with the lyricism of hip hop. 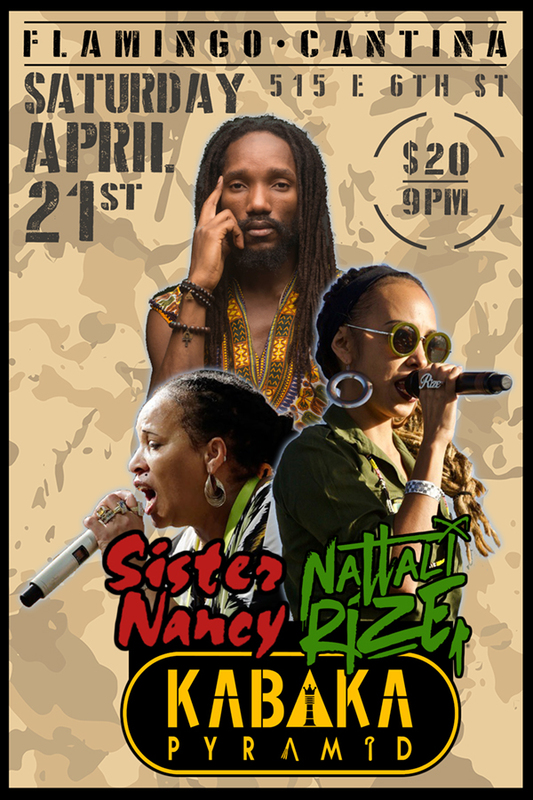 Nattali Rize is one of the few women who manage to command attention in the very exclusive, male-centric reggae world. A huge talent for live shows, a unique personality and a very special voice have seduced Jamaican producers. Recorded in the mythic Tuff Gong studios with many in the Jamaican new generation her latest album is an additional jewel into the new roots movement with rock influences. We always LOVE having reggae legend Sister Nancy in the house! Hailing from Kingston, Jamaica Sister Nancy is known to the world as the first female dancehall DJ who provided us with the reggae classic, ‘Bam Bam’. But that’s not where her catalogue ends. Sister Nancy was and still is a talented singer and toaster who can keep a party going all night long.